PadLock Screenlocker is a rather confusing computer infection that seems to be rather effective, but it does not provide any information on how the user is supposed to unlock their screen. As you can probably tell from the title, this infection is a screenlocker, so it means that the moment it infects your system, it locks you out of your desktop, virtually blocking you from accessing your files. However, you can climb over this malicious wall without any difficulties, and then all that is left to do is remove PadLock Screenlocker from your computer for good. Once you do it, do not forget to invest in a powerful security tool. Our security research team classifies PadLock Screenlocker as a Trojan infection. It means that this program enters your computer surreptitiously without your permission. Trojans usually pretend to be something they are not. For example, they could pose as useful applications that you can easily download from a third-party website. Although it is not clear per se how PadLock Screenlocker gets distributed around, it is very likely that it spreads with freeware and fake software cracks. Therefore, it is possible to avoid getting infected with this Trojan if you refrain from downloading freeware from file-sharing websites. Also, illegal software cracks also should not be your first pick when you need to get a license key for your new program. If possible, please purchase software from its legitimate sources. Then you will know for sure that no Trojans come with it. YOUR FILES HAVE BEEN DELETED & YOUR PC HAS BEEN LOCKED!!! Needless to say, when you see such a notification on your screen, it is only natural that it can scare you into thinking this is it. But please do not panic. Although PadLock Screenlocker says that your files have been deleted, the claim is a blatant lie. The Trojan is not sophisticated enough to delete all of your files. What’s more, the program does not give any follow-up information that should tell you how you can unlock your screen. Normally, Trojans and ransomware infections require users to pay a ransom fee for it, but it seems that the people behind this Trojan have not thought it through yet. Restarting your computer would not make the notification go away because upon the infection PadLock Screenlocker creates a Run registry key entry in the HKEY_CURRENT_USER\Software\Microsoft\Windows\CurrentVersion\Run directory. As a result, the program auto-starts with Windows each time you turn on your computer and your screen remains locked. However, you can easily close the lock screen message with the Ctrl+Shift+Esc command by opening Task Manager and killing the malicious process. What’s more, the notification comes with a text box that requires user to enter a code to unlock the screen. You can try out the code above to unlock you desktop. But please note that if you manage to unlock your screen with this code, then the Run key created by the Trojan will not disappear, and the malicious file which launched the infection remains on your computer, too. 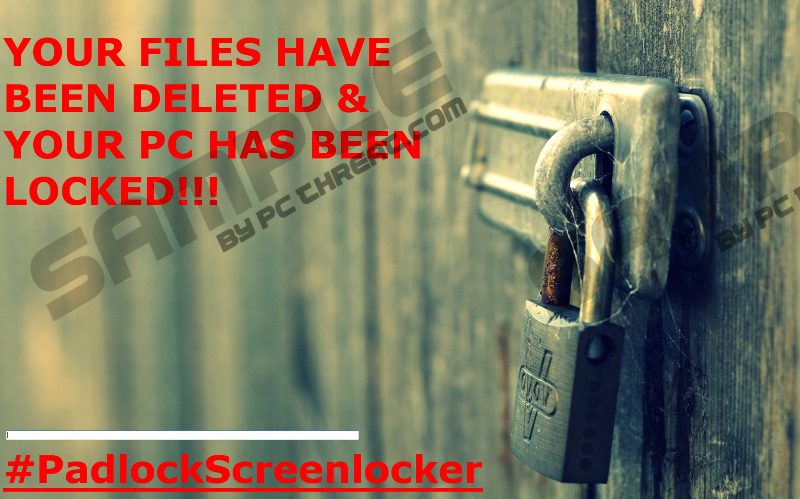 Therefore, you have to remove the malicious PadLock Screenlocker file from your system. Otherwise, the moment you reboot your PC, the infection will lock your screen up again. You can remove PadLock Screenlocker following the instructions our research team provides below this description. Please note that manual removal does not guarantee that all dangerous files will be deleted from your computer at once. Thus, it would be for the best if you invested in a powerful computer security tool that would help you terminate this Trojan and many other potential threats that could be present on your system. Please note that malicious programs seldom travel alone. Therefore, you will do yourself a favor if you run a full system scan with the SpyHunter free scanner. The tool will help you determine just how many unwanted applications are present on your system, and it will help you get rid of them all. Enter the ajVr/G\RJz0R code into the code box and press Enter. If the code does not work, press Ctrl+Shif+Esc and open Task Manager. Delete the malicious file that launched the infection. On right pane, right-click and delete the Google Chrome value. Quick & tested solution for PadLock Screenlocker removal.